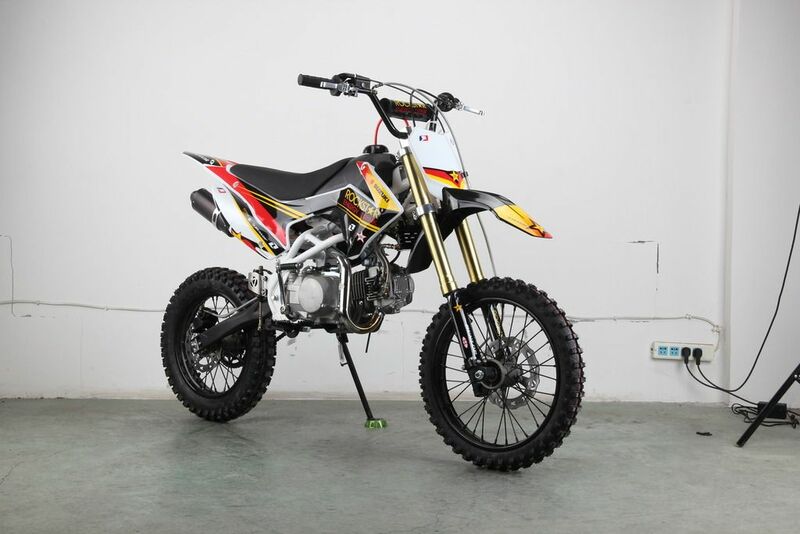 This is a larger sized pit bike in the Honda CR110 style and will be more suited to the taller rider than the smaller CRF50 sized machines. 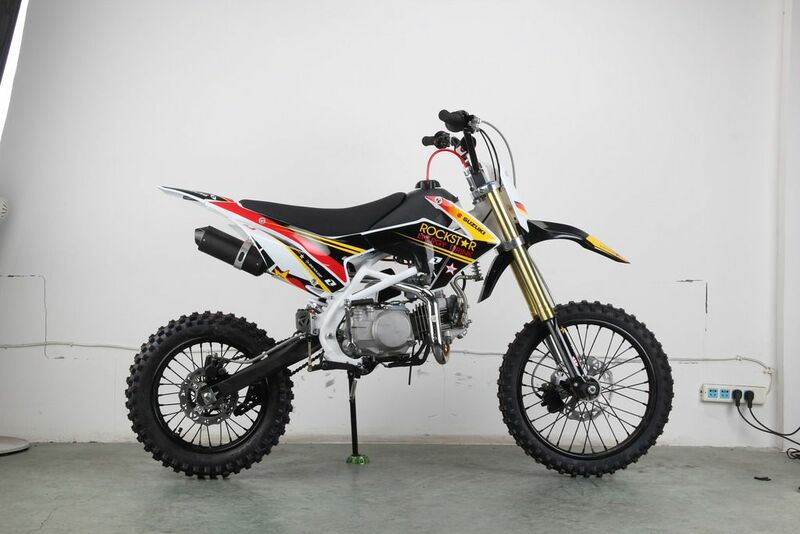 We have had these custom built for us by a company that has been building bikes for the 2 most well known brands for several years, we decided to start selling bikes as the companies in question now sell parts so it is only fair we trade in the same way. 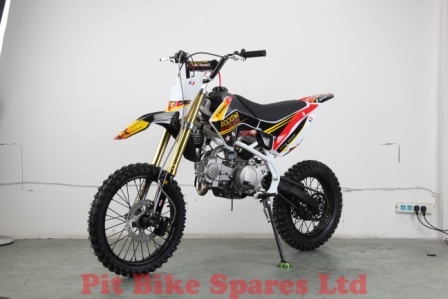 Pit Bike Spares Ltd have been trading for 10 years and have more independent experience in Pit Bikes & parts than our competitors. YX140 oil cooled engine with all up gears. Carburettor with large twin foam air filter. 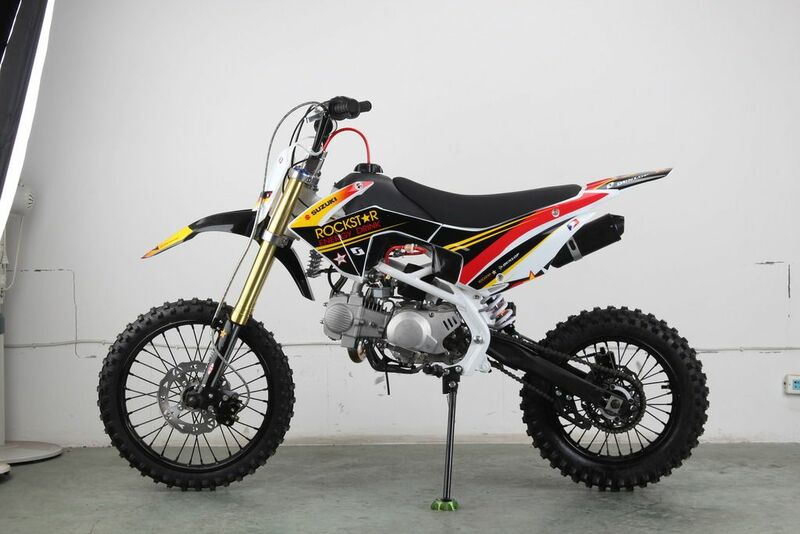 735mm oil filled USD forks with long travel, piggy back rear shock, 17" front & 14" rear SDG alloy hub wheels with powder coated steel rims, MX pattern tyres, oval exhaust with heat shield, polypropylene CRF110 sized plastics with Rockstar Energy graphics, 190mm vented front disc with hydraulic brake assembly & braided hose, 190mm vented rear disc with hydraulic brake assembly and braided hose, folding brake lever, clutch lever & gear lever, light weight high strength bars, heavy duty chrome steel trellis frame powder coated white, heavy duty chain, engine sump guard. Bike will be supplied in a metal crate and will require some assembly. 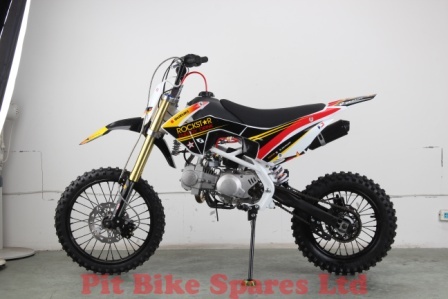 We can assemble & PDI bikes that are to be collected for £49. Collection by appointment only from Alcester Warwickshire. We can deliver to most inland areas for £49 but only to the confirmed paypal address. Bikes can not be delivered assembled. Bike may have slight changes from pictures. We recommend you read our trading terms prior to purchase as it has all warranty information.